Swift Current Petroglyph Boulder Provincial Heritage Property.
. Saskatchewan is endowed with a rich and diverse archaeological heritage reflecting more than 12,000 years of human history. Archaeological sites and landscapes in Saskatchewan, whether ancient First Nations encampments and rock paintings, Métis wintering villages, Euro-Canadian Fur Trade Posts, or historic Pioneer settlements, are valued today for their humanistic and scientific significance. From a humanistic perspective, archaeological sites have historical, social, religious or other special symbolic or cultural value. They are preserved to be understood and appreciated, and often contribute towards a deeper sense of community identity and respect for other cultures. Scientifically, archaeological sites contain a unique body of data that bears directly upon our understanding of human behaviour and societal change over time. They also contribute to our knowledge of past environments, including changes in species, bio-geography, vegetation, and Climate, and of various aspects of human biology and evolution. Today, archaeological sites are used for scholarly research, Education and interpretation, land-use planning, heritage tourism, and traditional ceremonial or other cultural uses. 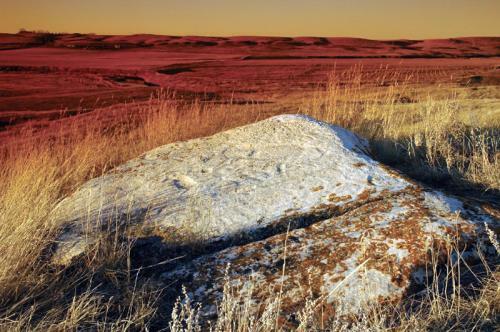 As physical and often inconspicuous components of the land, however, Saskatchewan's archaeological heritage is particularly vulnerable to disturbance or destruction from Land Use and development and natural erosion. When archaeological sites are disturbed, their value to contemporary society may be significantly diminished or lost altogether. As archaeological sites are also non-renewable and measurably finite in quantity, and, consequently, the archaeological record of Canada is gradually being erased. For these reasons, and because they are a valued public resource, Saskatchewan's archaeological sites require both responsible stewardship and legal protection (from destructive land developments, vandalism and theft, and other consumptive misuse). Archaeological resource protection refers to the application of laws to safeguard the integrity of archaeological sites for present and future use. In Saskatchewan, archaeological resource protection is achieved through the enabling and regulatory provisions of The Heritage Property Act. Saskatchewan's Parks Act also serves to protect archaeological sites located on provincial park lands and those specifically scheduled as “protected areas.” The Heritage Property Act is administered by the Department of Culture, Youth and Recreation, while The Parks Act is administered by Saskatchewan Environment. Key protection provisions are those that: require land developers whose activities may threaten archaeological sites to assess impacts and implement conservation measures; require persons to immediately cease activities that damage archaeological sites until proper assessments are completed; regulate the consumptive use of archaeological sites through an investigation permitting system; restrict access to information to prevent loss or damage to archaeological property; impose land use and development controls on heritage properties through their formal “designation,” and; provide for covenants and Conservation easements to protect and preserve archaeological property. The Act also affords explicit protection to archaeological burials, rock art sites, and other “sites of a special nature,” and provides for Crown ownership of Saskatchewan archaeological objects to prohibit their sale or unauthorized removal from the province. Archaeological resource management involves activities and procedures to enable the identification, scientific investigation, preservation, interpretation, economic development and sustainability, or other appropriate use of archaeological sites and objects. Resource management is often about making choices and selective decisions to balance archaeological preservation with other public interests and needs, such as resource and energy development. The government of Saskatchewan, in its capacity to administer and enforce The Heritage Property Act, is the primary steward of archaeological heritage within the province. However, municipal governments, specifically those that designate or establish zoning to protect heritage property, are also important stewards of the resource. As well, private property owners, whose lands contain archaeological sites, and avocational archaeologists who record and report new discoveries, are often crucial partners with government in resource protection and stewardship. The government of Canada is responsible for the protection and management of sites found on federal lands within the province. In Saskatchewan, the main goals of archaeological resource management are to: control or prevent the uncontrolled loss of archaeological sites and regulate their consumptive use; protect and preserve significant and representative sites; facilitate responsible public access to and use of the resource, and; foster greater public awareness, understanding, and appreciation of archaeological heritage. To control resource loss, proposed land developments (such as Mining, Forestry, oil and gas development, Crown land dispositions, and so on) are routinely reviewed to determine their possible impact on archaeological heritage. Where adverse impacts are likely, developers are required (as a condition of project approval) to document, assess, and mitigate development-related impacts. Mitigation may entail archaeological salvage excavation, avoidance through project relocation or re-design, or selective preservation. All impact assessment/mitigation studies (as well as scientific research) that may impact the resource must be carried out by qualified personnel, under approved permits. Permits safeguard the resource by ensuring that investigators have legitimate reasons for conducting their studies, are qualified to do so, use appropriate methods of inquiry, and report their findings for the benefit of other investigators or the public in a timely manner. While archaeological resource protection occurs through legal means, preservation is achieved through a combination of study and intervention aimed at conserving a site in its best possible condition. This may involve active physical protection, site stabilization, restoration, or site monitoring and maintenance to prevent further deterioration. Determining which sites to protect and preserve often requires systematic and thematic planning, significance assessment, comparative analysis, and other research. Responsible public access to and use of the archaeological resource (for research, recreational, cultural, or other purpose) is achieved by developing and managing a provincial site registry, providing for the management and care of archaeological collections, developing culturally sensitive policies (e.g., those that acknowledge and respect First Nations traditions and customs), and by providing web-based information, technical advice, and liaison services. Enforcing regulations and standards, and disseminating educational materials help prevent or minimize irresponsible use of the resource. A significant objective of archaeological resource management today is to build general public awareness and appreciation of archaeology and its contribution to society. Based on thorough research and consultation, communication efforts aim to further the public's archaeological understanding in accurate, culturally sensitive and meaningful ways. Common mediums for presenting archaeological information include museum displays, written materials, audio-visual productions, and various programs and activities. “Public Archaeology” programs, in which the public is provided opportunities to participate or otherwise experience field and laboratory work firsthand, can be particularly effective in enhancing public awareness and appreciation of the archaeological past. Archaeological resource management in Saskatchewan continues to evolve in response to new technologies, changing economic conditions, increasing public interest, and legal decisions (such as those relating to Aboriginal rights and related issues). Collaborating with First Nations and Métis (e.g., by incorporating oral history, traditional knowledge and community values in resource management and decision making), and with all sectors of the province's archaeological heritage community (including learning institutions, heritage associations, professional consultants and researchers, avocational archaeologists, land developers, and property owners) are vital ingredients for successful archaeological resource management. Through sensible administration of The Heritage Property Act and the support and active participation of heritage stakeholders and the public, Saskatchewan's archaeological heritage will continue to provide scientific, educational, social and economic benefits to present and future generations.